Bye Peanut Shell, thanks for the memories! This week I finally got around to something I'd meant to do for ages: removing the last baby seat from the Yuba Mundo. 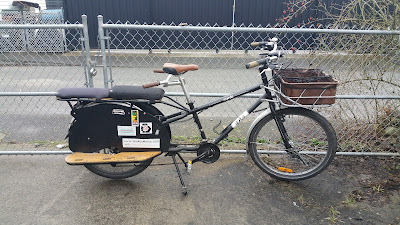 We bought our Yuba Mundo longtail at the Bike Doctor almost three years ago. At the time, we had one Peanut Shell seat on it for each kid. We soon realized Linnaeus didn't really need a child seat, being well past the stage of napping on the bike & fully able to hold on himself without being strapped in. So around his fourth birthday, we swapped the seat for a seat cushion, foot pegs & his own set of handlebars to hang onto. Bronte rode in the remaining Peanut Shell for about two years, counting thousands of kilometres, taking many a nap. Until she decided she was far too big to sit in a baby seat. To be honest, we were really reluctant to let her sit on the deck on her own, unsecured, so we put it off & tried to convince her to submit to being buckled in as long as we could. Then the Bakfiets sort of fell out of the sky (lucky 'barn find' on Craigslist that we had to do a lot of work to) & that was both kids' ride of choice due to the novelty of sitting in front in their own tiny living room, essentially. After a month or two, the kids started to realize that they could each have a cargo bike to themselves (aside from the parent who was pedalling it, of course) so they started riding on the Yuba again. Gradually, we started letting Bronte ride on the deck on her own, first on off road paths like the seawall, then short rides to preschool, etc. So it was finally time to remove the last vestige of baby gear from our cargo bikes. I'm actually a bit nostalgic about it. We're at the point where all the baby gear is piling up: crib, baby chair, booster seat, baby toys, bike seats, but we're past the baby stage in our family. 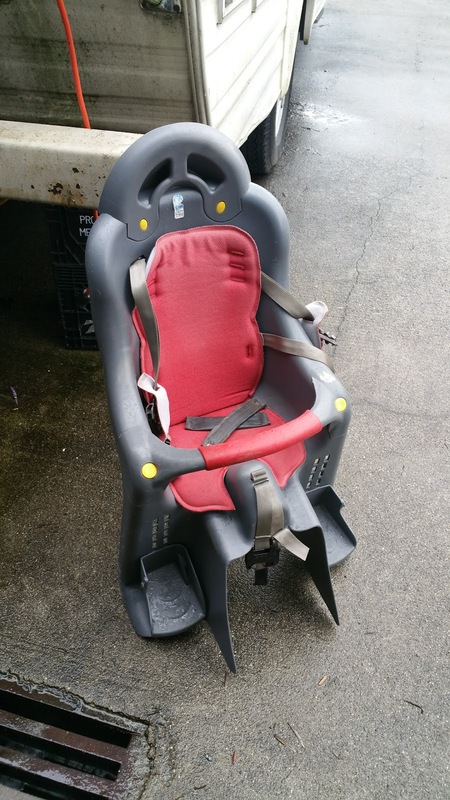 We need to pass this stuff along to the next family so it gets used, rather than just collecting dust in our garage. So now, here we are with a sleek looking longtail. Well, sleeker than before, anyway--it's still more of a minivan than a sports car. Now carrying cargo with the bags or strapping things on to the rear deck will be even simpler. Towing bikes--which is one of the main advantages of a longtail bike over a bakfiets--will be much easier now without the legs of the baby seat in the way. Probably the biggest difference will be for carrying an adult passenger--it's a lot easier to hop on the back of the bike without a baby seat to get a leg around. 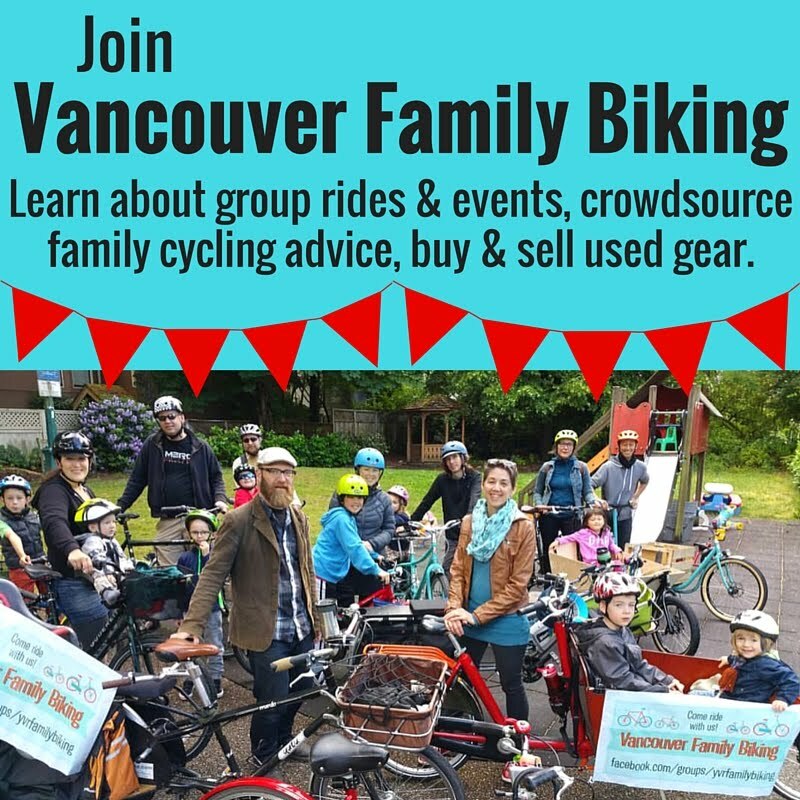 Another thing I got done today was to plan the next Vancouver Family Biking event. Join us April 16th for our third annual Easter Bonnet Ride & Egg Hunt! We'll be donning our craziest Easter bonnets, decorating bikes with bunnies & riding out to Jericho to find some eggs in the grass & have a picnic. You can find more details on the Facebook event page here. Please RSVP on the Facebook event page so we know how many treats to bring to the egg hunt.